Last warning: If you have any inclination to play in this game, turn back now. If you are a player, I recommend you return here. The full character sheets can be found in a GoogleDoc here. I recommend that you download the file and adjust the margins so that the questionnaires all fit on one page. The descriptions are spoiler free, and can be offered to your players to help them choose. Abandoned Lunatic Asylum–This one has Bee Swarm, Sour Winds, and Kocking, as well as a variety of quiet voices. Deserted Desert House–Mostly in the end-game for various laughs and creepy music. Friendly Tavern–Best used down on low in Maggie’s. Witchwood–Bonus points, this one is part of the free trial. The Witchwood Harp is especially good for setting a generically creepy feel. Frozen Moon–General purpose chilly winds. The Peninsula is markedly colder and more windy than the Seattle area. A re-purposed mansion turned bed and breakfast, named the Kingston Castle. It sits just outside of the town of Kingston Harbor (based on the town of Aberdeen, Washington). It is mid-January, just before the bulk of the rainy season hits. The mist is also especially thick, so if you have the time/money to take the extra step, invest in some bowls of dry ice. If you do not live around the PNW, a little background may be in order: There is an interesting sort of dread and pity that those around the Seattle area have for the Peninsula, and for Kingston Harbor (Aberdeen) in particular. It’s perceived as being poor, grimy, and full of addicts, as well as being suspiciously rural. While the real-life Aberdeen is much more multi-faceted, this is a horror game, and sympathetic towns are not the name of the game. This is a psychological horror story in the form of a Dread game. The characters are mostly employees of the tech industry giant, Congo Solutions, and a few mutual friends. In order to get a break from the busy urban environment of Seattle, the group is going on a company retreat to the Peninsula. Part of the goal is to build as much suspense as possible before they get to the bed and breakfast, so the characters are as spooked as possible. Each of the characters has one or more questions that hint towards some sort of phobia or mental delusion (some more than others) so be sure to leverage these to your advantage and have the players make some pulls. Furthermore, the town of Kingston Harbor has several potential red herrings meant to build tension, but that could soon run its course if you let them follow those too far. The Californian in particular has a reason to have an EMF detector, so be sure to use it going off to your best advantage. Once they are at the Kingston Castle, make sure that things seem very slightly off. For example, the photos that were shown on the website show the house as looking more run down than it currently is, and there are flowers blooming that have no right to in the middle of January. If you are lucky, one or more of the characters is inclined to murder, but if not, the house and its caretakers will definitely do the job. The house is trying to cause the deaths of the players to feed itself, and any corpses or bloody puddles quickly disappears. It may try to contact any mentally vulnerably or psychically sensitive individuals to do its bidding. Work up to this slowly, but definitely try for a murder attempt of some sort on the first night. It almost certainly means that someone has died, or is slated for death at the very least. Anyone who is Doomed can be picked off by a murderer or the house at a thematically appropriate time. Such characters may also be mind-controlled by the house, but may not make any pulls. Instead, they become hazards for the other characters. Either way, a character who is doomed should see iconography of the house as having a tree growing through it, soaking up blood through its massive roots. The story starts on a Saturday morning, with the crew loading into the company van and heading south. Most of them may not even know where they are headed–in my game, the Californian told them the vague location, but specifically hid from them that this was all for his ghost hunting trip. He even insisted that all of his instruments were karaoke equipment. For more info on ghost hunting equipment, look here. The trip down can be as eventful or not as you want, but it does need to build tension. In my game, the Midwesterner (who was straight up a serial killer) had the woman he loved (and had murdered) appear to him on the route. He was driving and pulled over suddenly to talk to her, and she gave him a symbol on his palm. I chose the owl symbol from Twin Peaks, but anything properly spooky could work, as long as it seems meaningful and pops up in the wrong places. The National Aeronautic and Space Administration out of Washington D.C. is reporting unusually strong solar flare activity. Communities in the listening area are expected to experience periods of poor cell reception as well as possible power outages, unusual weather, strange lights, or other phenomenon. This gives you license to do all sorts of weird things, as well as keep them off the internet and smart phones as appropriate. The minivan is passing through a typical small town downtown. The buildings are old, and a character with an eye for history or architecture can place them around the turn of the 20th century. There are several homeless people clustered in doorways. The remnants of several “downtown revival” campaigns are visible in the form of aging statues, abandoned fountains, and several neglected miniature city parks. Occasional flickers from the obtusely modern L.E.D. street lamps and gusts of wind and auroras remind the players of the ongoing solar storm. Any character who prepared for the trip knows that the restaurant just coming visible in the thick fog is Maggie’s. The place is highly rated for its food and cocktails made with locally distilled spirits, and is reportedly haunted by its namesake Maggie Krieger, the Creeper of Kingston Harbor, and several of her victims. The interior of the restaurant is long and thin like the building. The western wall is mirrored to create the illusion of a larger dining hall. Also along the western wall about a third of the way in a beautiful antique bar houses an attractive young man tending bar and tools of his trade. The group is seated by a host and told that Veronica will be right with them. “They say Maggie was the most prolific serial killer of her day. She was a nurse at the hospital built for the loggers and sailors that would pass through. Her job gave her lots of access to men who could go missing without much fuss. Over time she started extorting the sick for money. Apparently whether they could pay or not she would eventually get bored with them. Once that happened she would incapacitate them with ether and play with them for a while before giving them a lethal injection. Then she’d have them delivered to the harbor by her son, who worked maintenance for the hospital. Veronica will show them pictures of shadows and orbs as well as an impressive photo of a woman’s reflection in the glass wearing old-timey clothing. Either Veronica or the Native that it was once the house of a local timber baron, James Rinbor. There are stories about how Maggie and James were lovers, and became so after she assisted in killing his wife, Annabelle–though no body was ever found. They later were in cahoots with some of Maggie’s killings, until she eventually did him in. It was Rinbor’s death that actually took Maggie to court and stopped her murder streak. Maggie’s is definitely haunted, but how you manifest this is up to you. In my game, the Good Samaritan had a glass eye through which he saw dead people floating in the harbor. Things could fly across the room and smash, cold spots could happen, a mysterious symbol could be present, something related to a phobia could appear. There is also a red herring in the form of a copycat killer around, mimicking Maggie’s MO, which is reported in the local news. Whether you want to have them be supernatural or not is a matter of choice, as is any returning roll. Upon arrival, the Californian at least notices (perhaps with regret) that the place doesn’t look nearly as haunted as it did online–the trip has been repainted, and some flowers are blooming around the front step. Any character even vaguely aware of local flora knows that this is very strange for this time of year, but it’s not blatantly supernatural. It could have been caused by heat from the foundation. Clearly. One of the other things the characters should notice is Hank. Hank is the brother of one of the owners, and serves as the Castle’s groundskeeper. He should be a menacing presence at best, always holding something potentially dangerous but explainable, like sheers or a hoe. He is lanky, with a hollow face and dark, dark eyes. If the characters commit any murders, he will quietly cover them up until the Castle takes the body. Inside, the elderly caretakers, Ms. Edna Porter and Mrs. Agatha Wright, greet them, and ask for a group picture with their old Polaroid instant camera. They mention the rules of the house, including that breakfast is at 8AM, lunch at noon, and supper at 6PM, and that the characters are never, ever to go in the kitchen. Sanitation requirements and all that. They also go on about the haunted history of the place, and clearly most of the Castle’s reputation and business are built on it being haunted. The couple are very sweet and grandmotherly-seeming, but in reality they serve the house. Arsenic in tea, sleeping drugs in supper, the whole lot. They are very sensitive to respect for one’s elder’s however, and will spare any character who is consistently polite. They dislike the idea of coffee, and will definitely attempt to poison any character who asks for it. Anyone who happens to murder one of the other characters is treated very well, and secretly given sweets or other special treats. Their housekeeper, Liza, is aware of the house. Though she doesn’t serve it directly, she turns a blind eye to the goings on there. Any character that is kind to her, however, receives a note on their pillow, reiterating the warning not to go into the kitchen. The characters are shown to the coat closet. If any character has an EMF detector, it will definitely get some high readings here. Strangely, the coat closet has a chimney inside it. If there is any investigation, it is revealed that there is a very old skeleton stuffed up it. This is the body of Annabelle Rinbor, though it’s very difficult to tell by this point. The characters are welcome to pick their own rooms. The number is variable, but I chose 13 (to better agitate the phobia of the Hipster), including the Sequoia Suite, which takes up the small third floor. Edna and Agatha stay downstairs in one of the rooms, while Hank is on the second floor in another. From here, the game is fairly open. The Castle doesn’t want anyone to leave the grounds once they’ve arrived, however, so journeys back to town are discouraged in a number of supernatural ways. Ideally, the murders (or the inclination to murder) should start soon. One of he facets of the house is that it has the ability to manifest strange-looking hornets. They should start somewhere strange but ultimately explainable. In my game, I chose the coat closet under the stairs. The closet is strange enough in that it has a chimney, and adding the low drone of a collection of hornets up inside simply makes it worse. The hornets can also infest the engine block of the company van if characters are thinking of leaving. While they are a construct of the house and can vanish, they can still sting painfully. Another ability of the house is that it can replicate the vision and voice of the character’s loved ones or enemies. These have no direct power, but are meant to lead characters into the pond out back to drown, or similar circumstance. Any who have died in the house can be manifested more physically, and can attack the living. When someone dies in the house, the corpse and any blood disappear fairly quickly when no one is looking, As more deaths occur, the house starts to look more and more well-kept; floors are suddenly polished, trees bloom from nowhere, lights seem brighter. The kitchen is where some of the previous guests have been stored in a huge walk-in freezer. Their things, pictures, and mementos are stored in Edna and Agatha’s room. Many of these are worked into a huge shrine to the house. Act II should take as long as it needs to, but as folks start to get suspicious or try to escape, move into Act III. Hank will finally step in as a murderer, or assistant to any existing murderers; Edna and Agatha will augment their poisoning with carving knives. As it gets more powerful, the Castle itself can act more and more, forcing more characters to make a pull to resist the urge to attack their friends. Escape is possible, but difficult, as the Castle is surrounded by invasive (and incredibly prickle) Himalayan blackberries, which might be partially animate by this point. Even running down the hill should require a pull, as the snow has melted and refrozen to make it a dangerously slippery slope. For those of you who haven’t heard of Dread yet, feel free to pop over here and familiarize yourself first. This particular piece is a game that I ran for my usual group back in January. Technically, this update will consist of two posts: a brief, spoiler-free summary and a list of characters, and then the full document. The first of course is meant for those who wish to play and can use to recommend it to a potential Host. The second is full of spoilers, and should be avoided by any who want to actually play it. This was supposed to be a simple company retreat. Then the solar flare started. As if that wasn’t enough, the bed and breakfast you’re staying at seems to have a few skeletons in its closets. Can you survive trust falls and team synergy long enough to escape the true danger? In order to lend a hand to new hosts and to provide ideas for experienced ones, I’ll be adding what happened with my group along the way. There are a lot of characters here, and you may not have a big enough group to play all of them. In this case, just re-arrange how they all know each other. The Californian, having picked the site of the retreat, is one of the more necessary characters, but their duties can be given to someone else if need be. The Californian. Another transplant from California, you traveled north to take a job at Congo Solutions, a tech company that your cousin (the Good Samaritan) has connections at. It’s not your first choice, but it pays the bills. On the side, you pursue a hobby as a supernatural investigator and were the one who chose the trip destination in hopes of finding spiritual activity. The Midwesterner. A recent arrival from a flyover state, you’ve always wanted to see the Pacific Northwest for yourself. Upon reconnecting with your friend from college (the Native), you finally see the opportunity. You don’t work at the company with most of the group, but a seat unexpectedly opened up at the last minute, and there have to be even numbers for trust falls, after all. The Assistant Manager. A veteran cubicle rat, you’ve been at Congo for more years than you care to admit, and you’ve spent most of it seeing younger employees be promoted over your head. The Trust-Funder. Child of one of the big-wigs of Congo, you have been given a ground level position there so as to better learn its inner workings. You’re going on this trip in an attempt feel more a part of the team. The Hipster. A flannel-wearing vinyl collector, you have a surprisingly good grasp on modern technology for someone so anachronistic. This snagged you a job at Congo Solutions when you moved north from Portland. The Good Samaritan. An over-worked social worker from the inner city. While you don’t work at Congo Solutions, you did help your cousin (the Californian) land a job their through your connections with your old high school buddy (the Trust-Funder) and so have been invited along. After the hell that has been work, a retreat sounds like a great excuse to take some time off. The Programmer. The team lead at Congo Solutions, you’re easily some of the best talent the company’s seen. It was your idea to go on this trip as a reward for the team doing so well on a recent rush job. Feel like Hosting? Pop on over here to read more. I know I promised to be more consistent with updates, but the recent move on top of deadlines has made it quite difficult. And–the most exciting part of all–I’m planning for a 10-ish day trip out east. Tuesday night I’m flying out redeye to Philadelphia to join a gaming marathon with the infamous Order of the Amber Die. If you haven’t heard of them, they are, in their own words “an association of Pathfinder players that are dedicated to the authentic completion of published adventures.” In the pursuit of this, they play weekend-long gaming marathons–with the goal being to play an entire Adventure Path book each weekend played–which they’ve taken to chronicling here on the Paizo blog. And in case you thought that this was going to be any ordinary gaming weekend, think again, because last time they played for 47+ hours out of 65. I hear that this coming session will be less so, but still looking at 14-ish hours a day of gaming, every day, for three days, as well as a shorter session that Thursday. Basically it’s a caricature of what everyone wishes they could have done in college. This session, the goal will be to play Pathfinder Adventure Path #111: Dreams of the Yellow King. While I won’t be playing a main PC, I’ll be running support in the form of Winter Klaczka, the changeling cleric of Pharasma. Sadly, due to budget and time restraints, I won’t be able to do an awesome cosplay of the lovely Winter, but that’s an ambition for another time (and another freelancing check). After the gaming marathon, if I manage to live through such a harrowing ordeal, I’ll be flying into St. Louis to visit with my one-time roommate there, and to play Dragon Age until my eyeballs fall out until that next weekend, which will be a friend’s wedding back in my home stomping grounds of Southern Illinois. After much celebration (and libation) I will then drag myself back onto a plane and fly back to my computer and thus to you, dear readers. I set up a Twitter for the occasion, so as to best chronicle my descent into madness as I play Strange Aeons, so do follow me at @purplegnomling if you’re into that sort of thing. Until next time, gnomling fans. Same(ish) bat time, same bat channel. Whew, I know that I said that the blog was alive again, but man is is hard to get back on the horse. That said, I’m not sure if I’m going to have time to do any of the usual subjects (talking about projects I’m on, drawing costumes based on wines, ect.) but I did have something gaming related going on this weekend, so now you all get to know about it. Back at PaizoCon2014, I had the distinct pleasure of meeting a fabulous group of people, some of whom became one of my main groups, and all of whom became my friends. One of the best things that came out of this meeting was the FATE setting of LOLON, also known as the League of Extraordinary Acronyms. Now I could go on for ages about LOLON and the lore that we created around it, but for now a short description will have to do. The game itself spanned two nights, but the bonds forged and the stories told have lasted much longer. In the spirit of that, the Seattle area members of this group hosted LOLONCON, featuring the GMing and playing talents of most of the original group. I’ll have the logo for the gathering up soon (EDIT: Logo posted! ), but in the meantime, here’s a picture of a button made for the occasion. The resolution isn’t great here, but featured is a tentacled “L” for the Lovecraftian aspect of many of the games, a zeppelini as the “O”, a Dread tower for the “L”, a d20 for the “O”, and a Numenera “N” for all the Cypher system games played. Just this past weekend, the Canadian members of LOLON hosted LOLONCON Canada, on account of one of the group’s Australian members paying them a visit. As expected, it was a great time, featuring a game of Dread, a Victorian Monster Hunter game in the Cypher system, and two new systems I had never tried. The first of these was the Maelstrom system, which I had never heard of, let alone played. Turns out that it was first written by a 14-year-old in the early eighties, within a few years of the first Call of Cthulhu edition. It is clearly made along the same lines, focusing on d-percentile rolls, with the goal of rolling under your skill number, and a realistic feel. There are only ten skills, however, and the mechanic of potentially improving every time you succeed means that there is an exhilarating sense of advancement. As someone who plays a fair amount of CoC 7th ed, however, there is a let down when there is the same amount of success when, aiming for a 50, you roll a 2 as when you roll a 49. Still, it’s a nice look at how systems evolve. Secondly there was the Gumshoe system. This is a family of settings, each with their own skills and pertinent rules. For example, we played both Ashen Stars (a post-Federation Star Trek/ Firefly-esque setting) and Night’s Black Agents (vampire hunters) and each had similar, if differently named skills, along with a host of setting-specific goodies, like biotech and the like. My favorite thing about this system is the division between Investigative Skills and General Skills. Investigative skills usually do not require a roll. You are assumed competent enough to find out a general set of information based on your skill rank. You can spend a number of points equal to your skill rank to gain more information, but this does not replenish until the end of the game, so spend carefully. General skills generally must be rolled, but you can spend out of your skill rank to give yourself a bonus. Another great mechanic is the piggyback, where one player rolls (spending points as they choose) and others can donate points of their own to lower the difficulty, with everyone involved sharing in the success or failure. You can read more about Ashen Stars (and other great stuff) at Lou Agresta’s RPG Agression. But I think that’s enough prattle for now. I’ve found out recently that I’m moving post-haste, and need to throw some more things in boxes. Tune in next week, same gnomling time (sort of) same gnomling channel. Considering that it’s now October, I think it’s a fitting time for Gnomling’s Corner to creak back to life. Also, more importantly, I’m going to be freelancing full time through the holiday season, so I’ll have plenty of projects to talk about and hopefully plenty of time to write about them. Enabling this is an upcoming move, but that should have minimal effect on updates. On that note, stay tuned, readers. Same gnomling time, same gnomling channel. Sorry for the interupption in gnomling broadcasts–I managed to come down with an unenviable combination of strep throat and the flu for a week and a half, and then went straight on to apartment hunting. The situation is still in limbo, but that’s neither here nor there–on to the good stuff! I really must start this overview by admitting that I really like Dain’s journal entry style, which gives the piece a much more personable air. Instead of just being clinically told of these immensely powerful and little understood forces of nature, we are instead informed by our narrator (a one Remi Haden-Franz) through his experiences with them. The tone of his narrative is of one with more experience than most, but who still isn’t wholly sure of what he is dealing with. Interspersed with the story are more practical bits of information, such as abilities and whatnot, making running such creatures far easier. 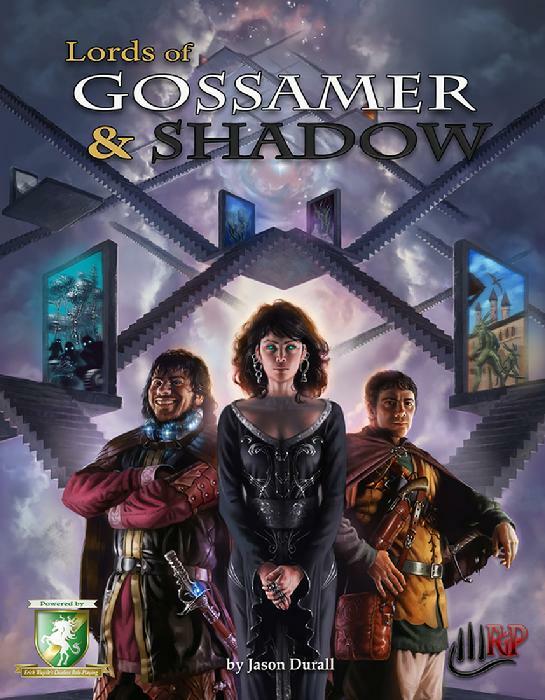 For those of you not in the know, Lords of Gossamer and Shadow uses the idea that there is not one world, but many. These worlds are connected via a strange interdimensional space known as the Grand Stair, which is traversed mainly by Wardens and Masters of the Stair. My favorite part of this setup is that it allows a nigh-limitless assortment of player characters. Your group can’t decide whether to do Sci-Fi or high Fantasy, or gritty Noir? How about all of the things? As the title of the game implies, there are other forces at work here, not the least of which is the Eidolon (representing order) and the Umbra (more along the lines of destructive chaos). In this piece, we focus mostly on the Eidolon, as the Annunaki themselves are representations of the Eidolon, all serving some unknown purpose–either of their own, of the Eidolon’s, or of some long-dead creator, who can say? I’ll not give the game away on just what Remi discovers, but suffice to say that Secrets of the Annunaki is not just some small bestiary to brows for stats–it’s a story of the rise and fall of a character that, despite his hubris, a reader can come to be invested in. 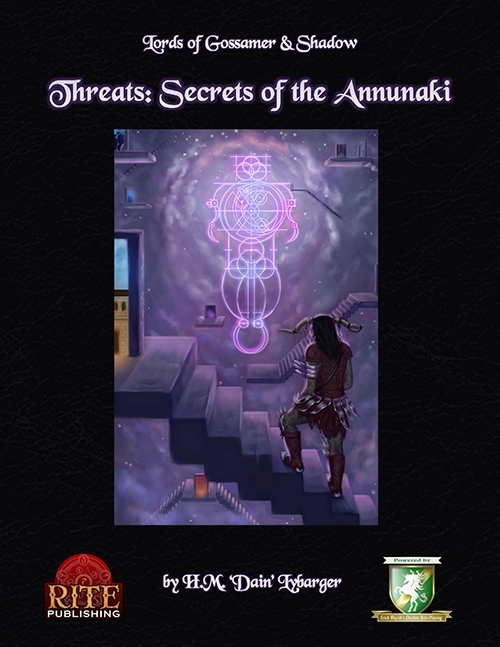 For those of you interested in purchasing Secrets of the Annunaki, you can find it at drivethrurpg.com. Which you totally should. I don’t have an appropriate picture of Planet Fiction for you, since it won’t be out for a few weeks, but hopefully the sneak-peak will make up for your disappointment. For now, just picture our world. Mostly. Again, I very much appreciate Dain’s narrative style. If anything, it’s even better here. We’re following Remi again. I’m not sure whether or not this happens right after the events of Secrets of the Annunaki, but he always seems to be on the run from something so it’s a little hard to tell. Planet Fiction is an interesting piece, in that it takes stories that most of us are well-familiar with (and a few that we might not be) and puts them all together into an interesting medley–for example, Alice, of Wonderland fame, is one of Sherlock Holmes’ new Irregulars. Much like any of use would be, Remi is entranced with Planet Fiction, especially understandable in the face of the revelation that Remi is originally from our own world, just like all of the denizens of this strange Gossamer World. We follow his adventures through post-Revolutionary Poictesme (much like our own France), and on to other climes, such as fictionalized versions of Switzerland, Spain, and Portugal. He joins forces with such worthies as Don Quixote and rides with Captain Nemo to see the prophetess Cassandra. However, this isn’t just an interesting romp through literature, nor is it just a listing of potential settings. No, my favorite part about Planet Fiction is that the supplement itself has a plot. From the very beginning, there is foreshadowing, and at the end, a twist ending that may or may not be surprising, depending on how closely you’ve been following. All in all, I feel like Planet Fiction is an interesting setting, both for new and old players–the newer can feel secure in a setting that is (mostly) known to them, which more experienced players can turn character and plot to their advantage as it suits them. My apologies, both on the lateness of this post, and if it seems a bit rushed. You see, Memorial Day weekend is coming up, and that means PaizoCon! Additionally, it means that next post (hopefully next week sometime) will be a PaizoCon special, involving all the details and pictures that I can muster. For all you attending, I’ll see you there! I’ll be the one with the long blue hair. Or the short purple hair. Whichever. Don’t forget to tune in next time–same Gnomling time, same Gnomling channel. My deepest apologies that a third installment of Gnomling’s Corner has been slow in coming. I’ve had something of a bombshell dropped on me and need to find new housing within a month’s time–something that is obviously tricky,considering exorbitant Seattle rent. As a result, my blogging has suffered, but I’m looking for a proper post either later this week or early next week. Content is likely to be From the Desk of the (RPG) Editor, with focus on Rite Publishing’s Lords of Gossamer and Shadow. It’ll even be a double-size post, to make up for all of the waiting you’ve had to do! Tune in next post–different gnomling-time, same gnomling-channel. He was also fond of wandering across my keyboard, perhaps brought there by the oils from my fingers. 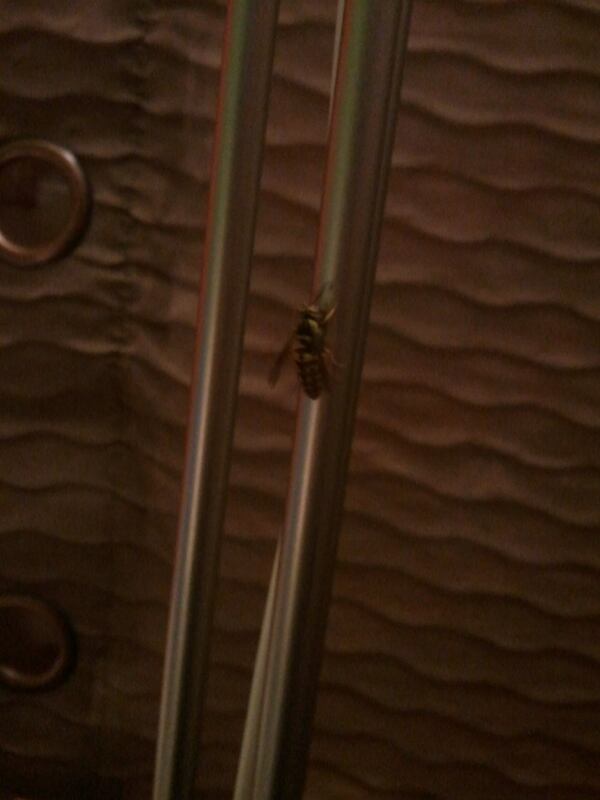 Let me tell you, few things make for worse typing than a curious yellow jacket. For he was a yellow jacket, I’d checked. I’d also found out that he might like some of the apples that I had in the kitchen, and I resolved to start leaving little bits out for him. For all that he couldn’t fly worth a damn, he was a clever little thing, and went in and out of the lamp several times, somehow endearing himself to me in the process. Alas, all good things must come to an end, and our time together ended perhaps more tragically than some. I like having candles burning while I work, and today was no exception. Now, when I said that Simon was clever, this was not to say that he was possessed of much common sense. Sadly, Simon had a tempestuous love for hot things that were likely to kill him, so of course he eventually tangoed with open flame. It ended poorly. 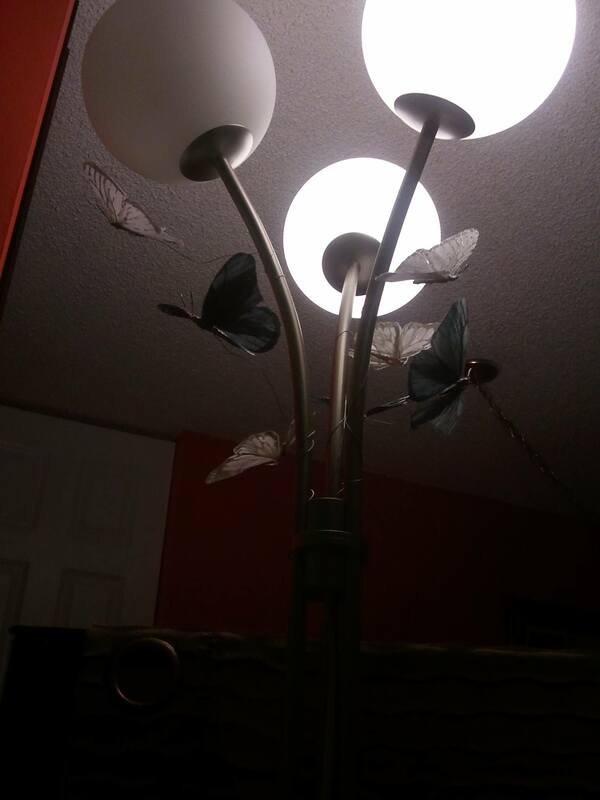 Surprisingly, he crashed but did not burn, and instead flew off and away (no more drunkenly than normal) and in the direction of the lamp. It all happened so suddenly that I couldn’t be sure of where he went, and subsequent huntings yielded nothing. It was then of course that I was struck by and idea: what if Simon had not died a burn-related death at all? What if I simply chose to pretend that he instead went to a magical land and had fantastic adventures? It seemed like a much better story, at any rate. With that, the story of A Girl and Her Wasp was born. I’ve not got any storyline done up yet, but the gist is that Simon is transported to a magic land, where he meets a girl named Sophia, called “Brave” for her daring deeds. Simon is drawn to her, as he is to all sources of light, and the two team up to go on further adventures. Along the way, they meet a host of characters, as one is wont to do in a magical land. Admittedly, these characters were created from small charms/ toys/ junk that gets left at the registers where I work, so the concepts need some tweaking. I name these things, give them a tiny sign introducing who they are, and then quietly mourn when they eventually disappear/ are thrown the the trash. This host currently includes a sentient lucky rock, and his friend, a small, sparkly white puff ball; Jonathan the angel and his brontosaurus friend, Monique; Ernest(a) the gender-fluid ladybug; Leviathan the Wonder Staple, and his sidekick, Froggy Rob; and Brook, a small, sparkly sphere, who I’m not sure about as far as species, but know that they are definitely gender neutral/ apathetic. So, to further this goal, I started drawing wasps here recently, so I can eventually draw a cute, cartoon-style Simon. Which is why there’s a drawing of a yellow jacket at the top. Now you know. Thoughts, questions, cries of despair? Do you have a suggestion on or character that should feature on A Girl and Her Wasp? Tell me below! In the meantime, I’ll see you next time–same gnome time, same gnome channel. It’s your favorite (and probably only) purple gnomling here to take care of introductions and give you the lowdown about what this blog is all about, so pull up a chair and make yourself comfortable by the fire. Warning: The following content may or may not involve profanity, anger issues, or the belief that all people deserve to be treated with respect. My name’s Savannah Broadway: (occasionally urban) fantasy writer, cross stitcher, RPG player, writer and editor, as well a lover of wine, women (and men, and non-binary folks, in no particular order), and song. I’ve worked as a Paizo intern, (mostly freelance) copy editor, general purpose binder and fixer at Morris Library’s preservation lab, and makeup person/ cashier. Disney’s Hades is my spirit animal, and I like the color purple. Also boxes. I really like boxes. Like, any kind of box, but mostly pretty wooden ones. In which I drink a bottle of wine (preferably with help), analyze the flavor, nose, ect, and then draw the wine as if it were a costume or a person. I’m not a super good artist, guys, so be warned. There will be crab-claw hands, and probably not a finger in sight. Forget about toes entirely. In which I discuss things I’m working on (as much as I can without violating NDAs and such) and things currently out. This will generally be editing for Kobold Press or Rite Publishing, but I do other things for other people, as well as write stuff for Paizo, 0one Games and others, so if you’re into any of the above, stay tuned. May also include what’s going on at whatever conventions I go to in a professional (or professional-ish) capacity. In which I talk about whatever, which could include things like LGBT/ women’s/ civil rights, how people (read, customers) can be generally terrible, or how much I don’t like socks. I won’t talk about or review 50 Shades of Grey, though. I mean it. I don’t need another ulcer in my life. And that’s it for now, dear reader. Tune in next week for another exciting update. Same gnomling time, same gnomling channel.